Ader Gym Chalk is a magnesium carbonate formula that helps remove moisture from athlete's hands. 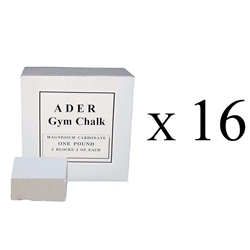 Ader Gym Chalk is a basic necessity for kettlebell training, and is used by body builders, power lifters, gymnasts, and rock climbers. Each box weighs 1lb, and contains 8 individual 2 oz blocks of chalk.